Can I just take a minute to talk about Picture Safe? I stumbled over this neat little dude late last night and just had to check it out. When you combine your multimedia, games and camera with your phone you can pretty much expect it (along with everything on it) to pass through the hands of many. Picture Safe is essentially a photo organizer that will safeguard your photos against wandering eyes and fidgety fingers. There are a couple of things I really like about Picture Safe. There are several ways for you to get pictures into the app, from selecting them from the default Photo app to Web, FTP, Bluetooth and USB access. Getting them onto the app is really easy and straightforward and once they are in there, you can just as easily backup, manage and organize them. Picture Safe supports high-res images up to 2500×2500 which is great for displaying and exporting images back onto your computer, definitely a one-up from the native Photo app which downsizes them. Now there is also a Video Safe function which you can upgrade to in-app for $2.99 and that will allow you to import videos into the app just as easily as images. you were looking at to something tame/lame of your choice. The greatest thing is that the app is subtlely labeled as “PS” on your iPhone, so you won’t have to worry that it’s just screaming that you’ve got something to hide. AppSafari review of Picture Safe (HiDef) was written by Aucoeur Ngo on March 4th, 2010 and categorized under App Store, Photos, Utilities, Video. Page viewed 10022 times, 4 so far today. Need help on using these apps? Please read the Help Page. I accidently deleted it, and i synced it back…all 489 pictures are gone, any way to get them back? Got a question…? How the HELL do I get to my pics if I forgot my password and can’t get back into my picture safe app??? I forgot my password but I remember setting up security questions. I just don’t know how to get to those questions. Plz hlp. I got the free app first and it does not work at all. I thought I needed upgrade so I paid 2.99 for upgrade. After a full day of working with it I finally got it to download pictures. App developer states in app store it is for IPAD. But it is not. This app has many bugs. Deeply disappointed with it. Would not recommend. Nic, it only lets you answer them if you have the snoop stopper enabled:( Mine worked fine and now it wont import anything!!! In today’s digital era, you have to take steps to back-up your photos. Whether onto your computer then into DVD archives, or print them out. DVDs will become obsolete in about 4-7 years depending on how often you burn info on them, CDs last longer, and harddrives last about 10 years if you keep them in good condition. It’s up to you to back your own stuff up. From Facebook, your phone, or from just your computer. Sorry, but apps like this aren’t responsible for your loss of images… that was up to you :/ On the bright side, you still have memories of those moments and that should be something! How do I get my photos back? I forgot my password please help thank you. How do I get to my pics if I forgot my password and can’t get back into my picture safe app??? 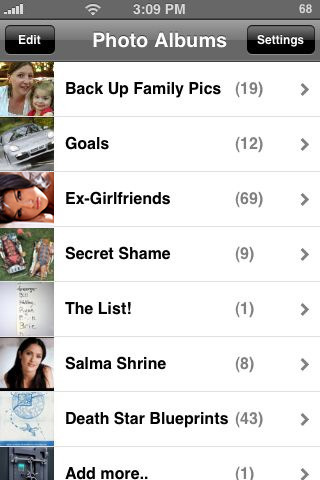 I also lost my photos when I got my new iPhone 5. Looks like this place is a waste of time for support. Where do I recover my photos. I wouldn’t waste my time or money on another product from these sellers.